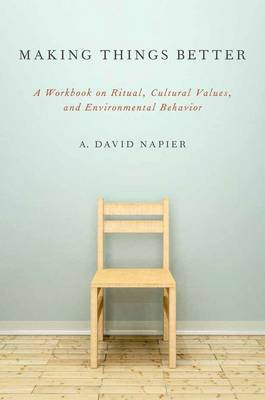 In Making Things Better, A. David Napier demonstrates how anthropological description of non-Western exchange practices and beliefs can be a tonic for contemporary economic systems in which our impersonal relationship to ''things'' transforms the animate elements of social life into inanimate sets of commodities. Such a fundamental transformation, Napier suggests, makes us automatons in globally integrated social circuits that generate a cast of a winners and losers engaged in hostile competition for wealth and power. Our impersonal relations to ''things''-and to people as well-are so ingrained in our being, we take them for granted as we sleepwalk through routine life. Like the surrealist artists of the 1920s who, through their art, poetry, films, and photography, fought a valiant battle against mind-numbing conformity, Napier provides exercises and practica designed to shock the reader from their wakeful sleep. These demonstrate powerfully the positively integrative social effects of more socially entangled, non-Western orientations to ''things'' and to ''people.'' His arguments also have implications for the rights and legal status of indigenous peoples, which are drawn out in the course of the book.